The front entryway and steps to your house speak volumes. They form an opportunity to express character and create a real sense of welcome. The materials used, the colors chosen, and the decorations added to it all are a focal point of your property. There are permanent elements to take into account during constructions or remodeling. There are also more temporary ones that can more easily be changed. Coordinating these elements into a beautiful and welcoming design is key to keeping your house the beautiful home you want it to be. While there may be some elements of our home that serve a merely decorative purpose, the entryway is clearly not one of them. After all, it’s the primary way that visitors and you yourself will enter your home. Of course, it’s also a key element of curb appeal – it will be one of the most obvious elements to anyone who sees your home from the street. Obviously, the first thing to keep in mind is how high your door is off the ground. If you require steps, you’ll have to consider the amount of space you want to take up with them. There are all kinds of rules about maximum height and minimum width for stairs. But there are a variety of ways you can lay them out. A step or two – or maybe even three – might work well in a straight line leading directly the door. But it can also look great to have “flights” of steps divided by a landing, even if each flight only has a single step or two. Of course, if you require even more steps, the way they are divided can vary. This can maximize your space as well as provide a place to rest packages or groceries or even have flower pots or other decorations. A landing right outside the door gives you a comfortable to stand to unlock the door. It can even serve to leave wet umbrellas, overshoes, or other articles you don’t want to drag into the house! Expand it a bit and you can have a full porch. 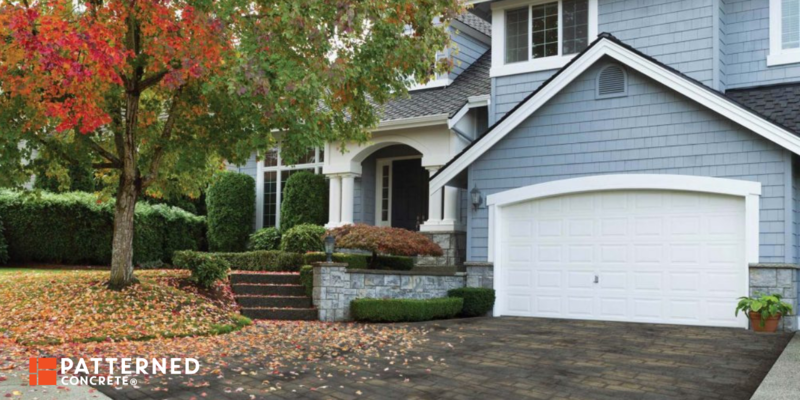 A roof over this landing can serve to protect you from the elements while you dig out your keys. It can also help keep the door and steps slightly cleaner. It might even help keep your house slightly cooler since the sun won’t beat directly on the door! You might also want to plan ahead for any possible access problems. If a member of your household has mobility issues already or you expect to be in the home into your old age, you may want to make extra efforts to allow space to convert steps to a ramp. Building codes usually require minimum widths for doors and steps, for example. Still, you can think ahead about where you might need to construct ramps or a lift if the need arises. Finally – at least as far as permanent elements go – lighting is important to take into account. Odds are that you or visitors aren’t always going to be arriving or leaving during the full light of day. Appropriate lighting helps protect you from falling on the steps, reduces the time it takes to unlock the door, and most importantly, provides a level of security. 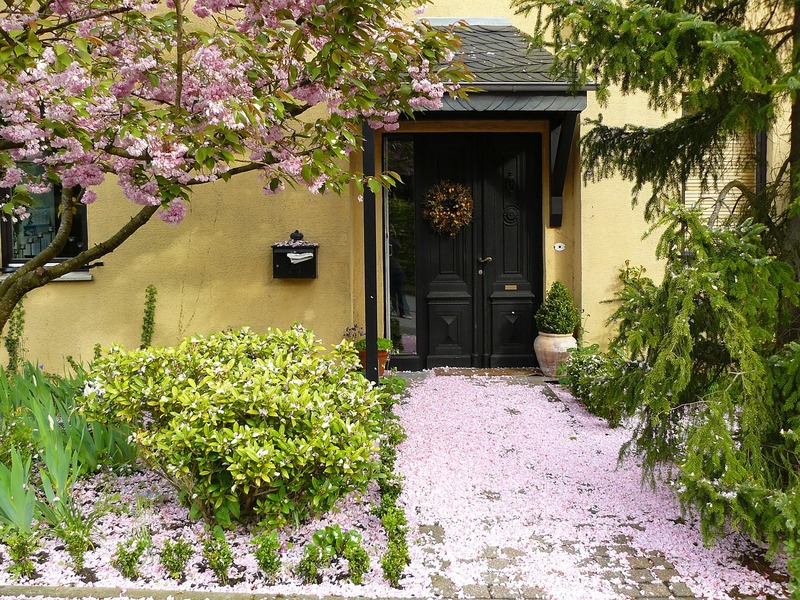 The most permanent elements of your entryway can include the path, steps, and landings, door and roof structure. While it’s possible to change these, it requires a lot of work and it’s not something you’re going to consider often, if at all. 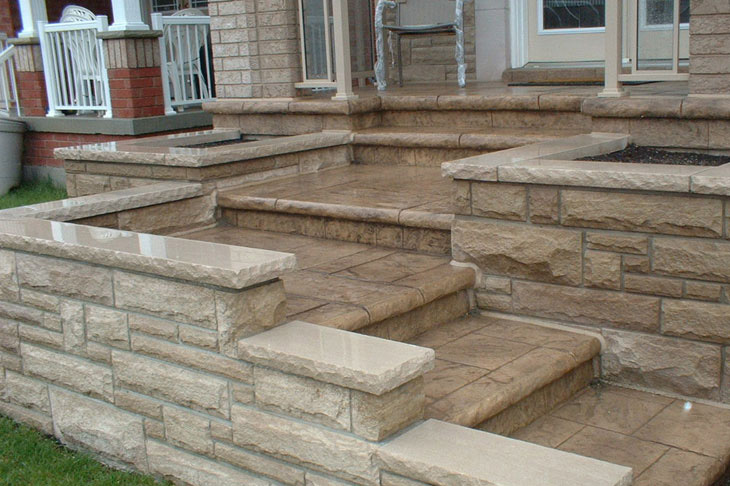 The design and layout of these long-lasting elements is, of course, tied into the appearance of your house as a whole. You may choose to have a path that leads from the street directly to the front door. You may elect to have one from the driveway. Or, you can have both. However you lay them out, you want to be sure they are wide enough to walk on as well as being safe. The layout you choose also depends on the architecture of your house and design of your lot. If you have a home that features crisp, straight lines and a driveway that is at a right angle to the house, you might want to reflect that with straight walkways and stairs and landings that are also clearly squared off. On the other hand, if the general lines of the structure are “softer”, you might want to opt for more of a meandering path and steps that follow a gentle curve. A landing or even porch outside the door can be a great addition. Aside from some practical considerations mentioned above, it can be an area to add plants or other decorative elements. You might even decide to make it large enough to accommodate a chair or two so you can sit outside and enjoy some fresh air. 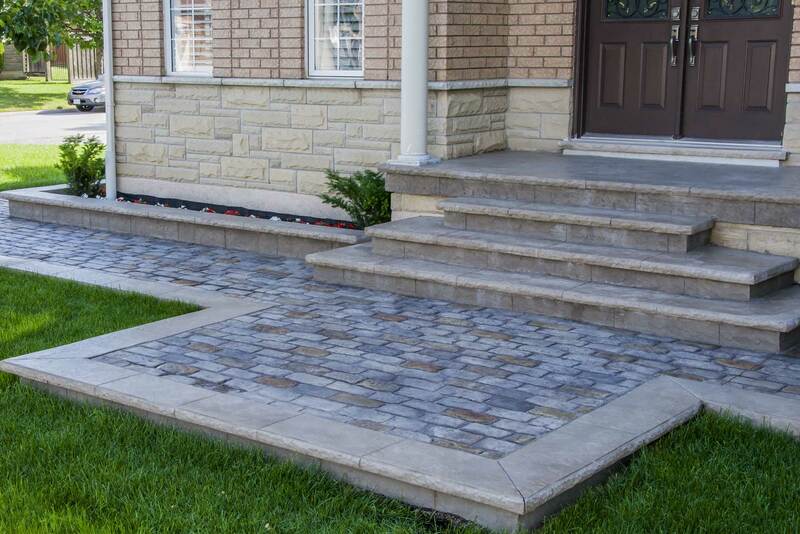 Stamped concrete is an ideal material for creating both the pathway and the stairs themselves. It provides a solid yet beautiful surface that will hold up for decades with minimal maintenance. You can continue the same design you chose for your stamped concrete driveway. The entire surface, including the steps and landings, can all be part of the same project to provide consistent beauty throughout. The door itself is another element that you’re most likely not going to replace. Of course, it needs to provide security for your home. But it can be a thing of beauty as well. A wood door with windows can be a beautiful option. A solid door with some carved design is also wonderful. Single or double door options can help you obtain the look you want. Also, panels around and above the door – whether they be windows or solid decorative pieces – help add a sense of depth. A smaller addition that can really add character to the door is a knocker. There are varieties available from relatively simple to extremely ornate. Again, it’s something that adds a bit of depth since it sits upon the door’s surface. There are also many knockers that are actually doorbells with the appearance of knockers. If you choose to cover the door area with a roof, it’s usually best to keep it as a natural extension of the house, drawing on the same roofing material, the same style trim, and any columns or supports coming from the same architectural school. The roof should be wide enough so that you are adequately protected from rain. But if you elect to have a porch, you might decide to have only a section covered, or go for the whole thing. Railings are another piece you can consider here. These can have a functional purpose in helping provide safety going up and down steps, or to keep young children from falling off a porch. But again, there are many options to choose from that don’t sacrifice beauty. Among my personal favorites are wrought iron or wooden rails, depending on the type of home. Once you’ve chosen and installed your structure, you can look at those things you can change more easily. Among these are paint, plants, furniture, and other decorations. Paint, at least in my opinion, falls into a “semi-permanent” category. It’s not something you’re going to change every few months. You may need a fresh coat after a few years, but I don’t think most people even consider changing the color scheme. If you don’t want to make a change, adding that fresh coat still helps restore some luster to your entryway. Over time, even the best paint begins to fade, so you can restore that fresh appearance with a new coat of paint as needed. But that doesn’t mean you have to stick to the same old color. Styles and tastes can change. You might want to keep more up-to-date with contemporary colors and designs. While often these changes will be part of repainting the whole house, a good eye for design can help you pick colors even if you only want to change the door and entryway area. Another way to bring brilliant colors and life to your entryway is through the use of plants. 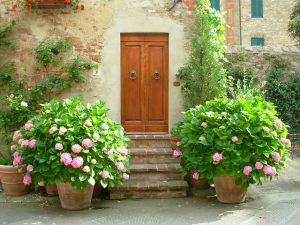 You can have flower beds or pots built into your landing and along the steps, or you can elect to use flower pots that you buy separately. The choice of plants and flowers depends largely on your climate and your own tastes, but of course, you want something that’s hardy since it’s likely you or others will be brushing into them as you come and go. For the same reason, you may not want to choose roses or other plants with thorns that you could prick yourself on if you make too wide a turn. You may also decide to change the plants seasonally – perhaps chrysanthemums in the fall and daffodils in the spring. You can then transfer them to other containers or plant them in your garden when you add new colors and types to the front entry. Climbing vines that follow the columns of your roof are great too! Vines can provide a truly classic feel to any building. If you’ve elected to have a larger porch area on the front of your house, adding furniture to it not only gives you a place to sit but also gives your home a “lived in” appearance. Adirondack chairs, rockers, or a porch swing are among the many options. You can choose to best match based on your architecture as well as how you’d like to use the furniture. Will it be just for show, or will you frequently sit out? Furniture, like paint, is something you probably don’t want to change too regularly. It’s expensive and generally hard to move. On the other hand, you may not want to leave it out year-round, especially if you live in a harsher climate. Some types can be painted, of course. Adding different types of cushions is another way to change the style based on the season. Ideas for decorating your entryway are limited only by your imagination – and what you can find on Pinterest! There are tons of great ideas online if you run out of your own thoughts. One common and easy-to-use decoration is a door wreath. There are many different-sized wreaths available, and they can be easily switched for the season. You can find them for sale everywhere, from high-end stores to flea markets. They even make a great handicrafts project to create yourself or with your children. Another idea I really like is house flags. There are some wonderful ideas and it’s pretty easy to attach a flag holder to your railing, roof column, or the side of the house. The flags usually measure about 28 inches (72 cm) high and 16 inches (40 cm) wide. Like wreaths, there are varieties available for just about any season, holiday, or any other theme you could imagine. A quality house flag is relatively inexpensive but made of materials that are weather-resistant and doesn’t fade in the sun. It should last for years while retaining its original appearance. If you have a mailbox at your house, its style also expresses your personality. In some cases, the mailbox might be right at the side of the street on a post. For others, it may be beside the door or even the kind that forms a slit in the door itself. Regardless, you should consider its style as something that should go well with the overall design you’re trying to achieve. Even a doormat can add a dash of color and express “welcome” (even quite literally) to all who come to the door. Holiday decorations according to your own taste can sit on or hang from the various parts of your entryway. How much you’d like to have and in what style really depends on your own taste – and perhaps the regulations of your homeowner’s association! These are just a few examples of ways to complement the style of your home, particularly the entryway. With a little thought and planning, you can come up with many more that will really help your home stand out. The entrance to your home greets you, your visitors and even your letter carrier on a daily basis. From the way you design it to how you decorate it, it speaks a lot about your own personality. There are many elements that go into it, and it’s always worth thinking about how it can make your home even more attractive! WE BELIEVE THAT NATURE'S BEAUTY SHOULD BE CELEBRATED AND MADE AVAILABLE TO EVERYONE, IN ALL IT'S FORMS, COLOURS, AND PATTERNS. With over 40 years of on-going research and development, our experience and workmanship strengthen the ability to maintain the quality and control of our service and products.